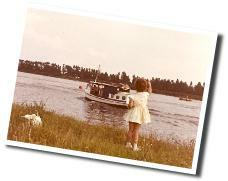 Being a busy businessman, dad decided that mother and his four daughters should take Engelenbak to Friesland on its maiden voyage ... without him!!! Not having spent anytime on the boat itself, he got the boat loaded up with supplies and sent the family off on their journey while he was working. Little did he think about the lack of skills or mechanical support on board. In due time the boat ended up in the village of Grouw in the province of Friesland. I am pretty certain that Engelenbak never left the dock after that journey.